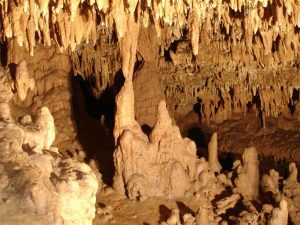 Kiesewetter Cave sits 160 feet above the Gasconade river 3 ½ miles south of Richland, Mo. It has a broad, low entrance and is secluded by Ozark trees and native plants. 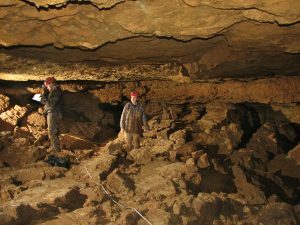 The cave is owned by the Missouri Caves and Karst Conservancy (MCKC) and is a permit cave. 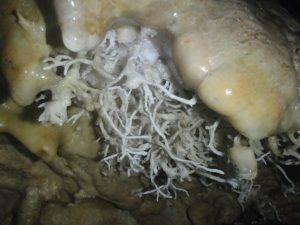 After a 52 foot hands and knees crawl from the gate the cave opens up to 3,168 feet of passage. There are two main passages, one being the Formation passage and the other more dominant main passage. 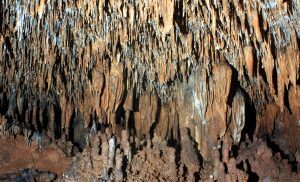 The Formation passage is approximately 300-400 feet long and is choked with formations at the start of the passage. The main passage meanders thru some low crawls into some big rooms and passage. 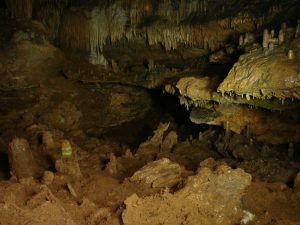 Hartwig’s Paradise, named after the former landowner, is one of the most pristine rooms in the cave. Loaded with blue green pools of water and white formations, it is a photographers dream. Past this room you will encounter the first breakdown room. From here is a low crawl for about 30 feet and then you encounter the ’87’ room, named after the ’87’ on the ceiling of the cave. 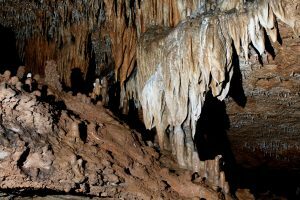 In the back of the room you will drop down about 15 feet and encounter a winding, high ceiling passage with lots of mud and a small stream. Soon you will reach a wide room with ceiling heights around 3-4 feet. Just before you get to the Birth Canal passage, there are several pools of water. At certain times of the year you will see baby salamanders in these pools. The Birth Canal is a very small squeeze that only a small person can get thru. Past this point there is still another 300-400 feet of passage.